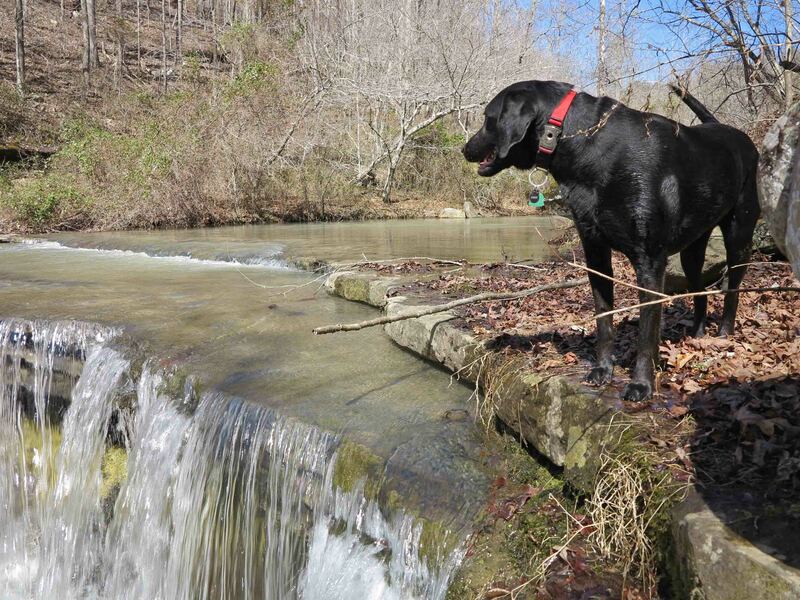 Had a great day sharing some favorite old trails with my “new” hiking buddy, found on the Ozark Highlands Trail in January of 2014. 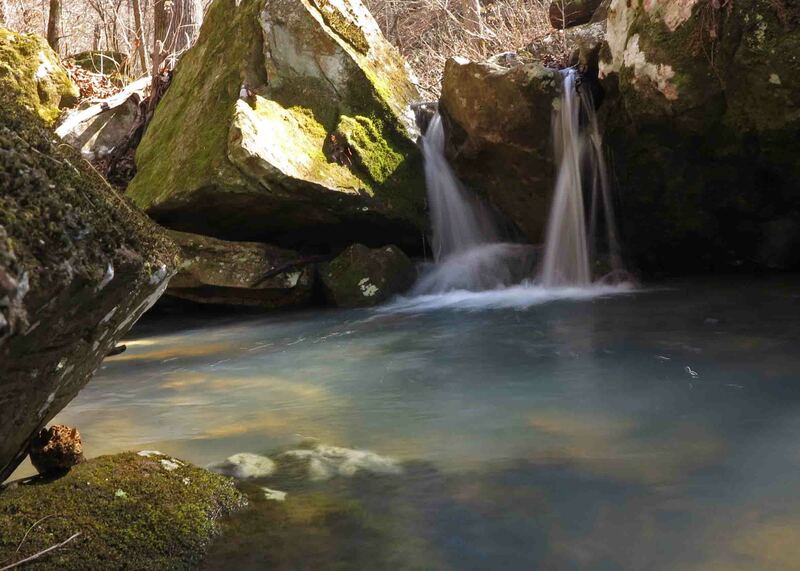 Shores Lake to White Rock Mountain Loop Trail is one of my all time favorites in Arkansas. I’ve done it as a day and overnighter many times. Part of the attraction might be its proximity to Alma, but the real attraction for me is the water, scenic valleys, and the visual payoff of passing by White Rock Mountain. It dawned on me that Hiker-dog had never done any of this trail, so we decided to remedy this and drive through the little community of Fern to Shores Lake. I’m working on a trail guide and decided a few months ago that this entire loop trail would not fit the book’s criteria for a typical day hike. However, the first section of the West Loop fits beautifully. The plan was to get GPS readings from Shores Lake to the White Rock Falls and then drive up to the White Rock Mountain Loop Trail. These two trails together gave us about 8 miles for the day (or maybe 10-12 for Hiker since she does a lot of off-trail sprinting). We met up with a delightful group of Boy Scouts at the Bliss Spring crossing. They were taking care of the environment and obviously had strong adult leadership for their troop. White Rock Creek was flowing. We left Hiker’s pack and my hiking poles on the trail and scrambled down (no trail here) to check out the Little Roaring Falls. 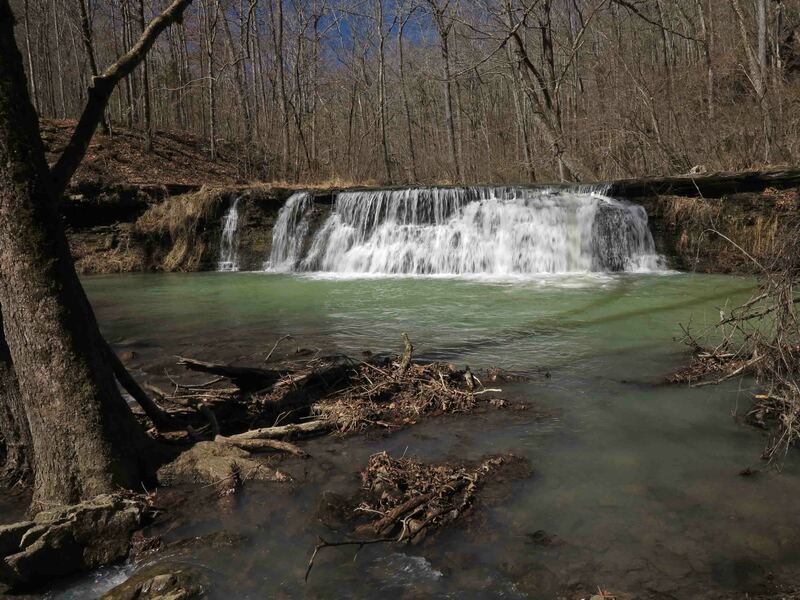 “Little Roaring Falls” is my name for this waterfall because you’ll hear a low roar as you approach. Hiker loved this spot and took the opportunity to explore over, under, and around the falls. She also had a good swim below the falls. I wished for a cloud cover, but it was a crystal clear day making for less than ideal photography lighting. 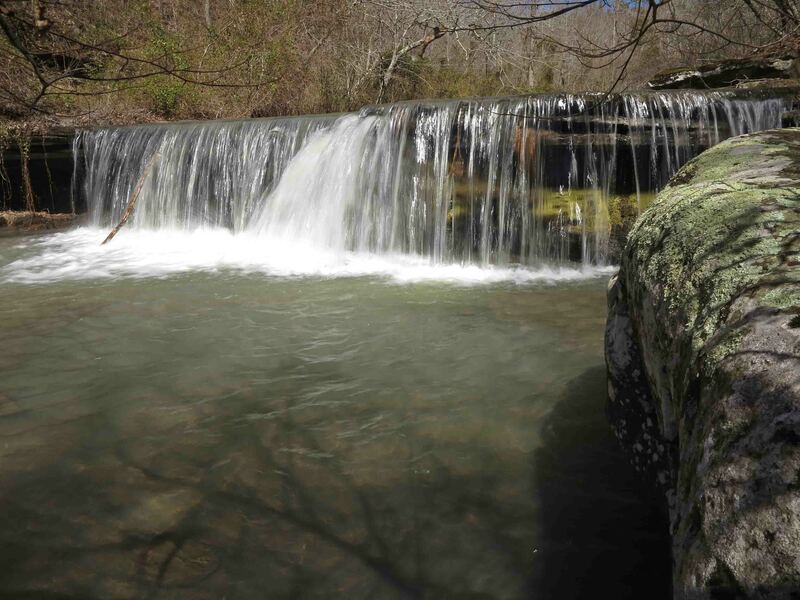 We continued down the trail, arriving at White Rock Falls at 2.8 miles. We returned to Shores Lake for a roundtrip hike of about 5.6 miles; a perfect day hike! 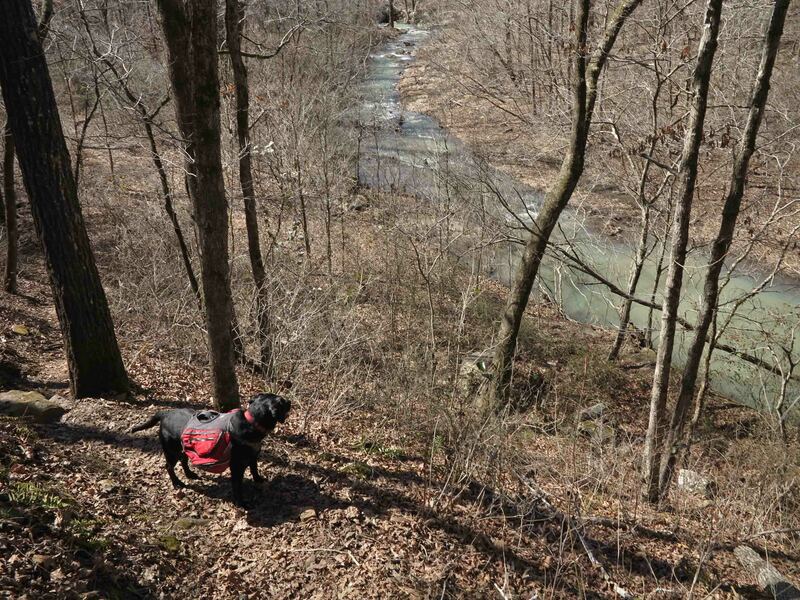 Hiker taking in the view of White Rock Creek as we returned to Shores Lake. We drove up to the Top of White Rock Mountain to hike the 2-mile loop trail. It had been several years since I did this loop on a foggy day, so this was like a brand new hike to me. The sign saying to keep an eye on your children gave me pause. I guess Hiker-dog could be thought of as a child at less than two years old, but between the two of us, I was more likely to fall. In fact, children suffer falls less often than adults. 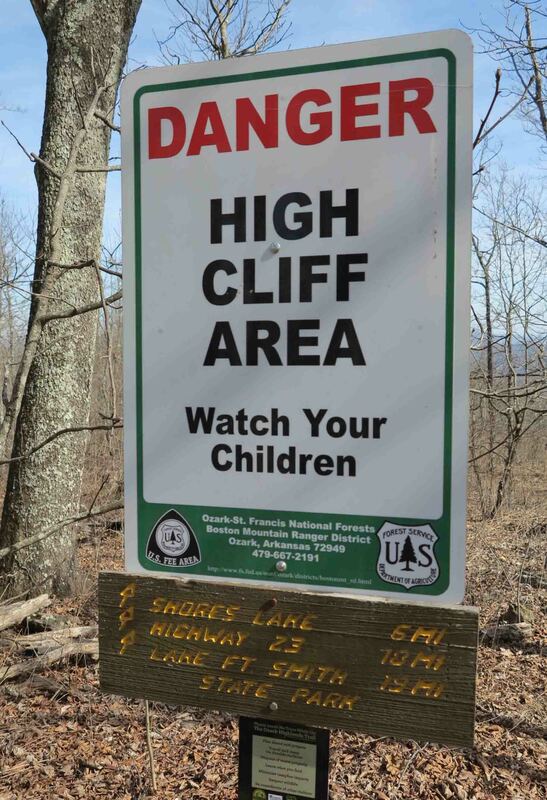 Maybe this sign should read, “Children, keep an eye on your parents.” I decided Hiker would be careful around these high bluffs. 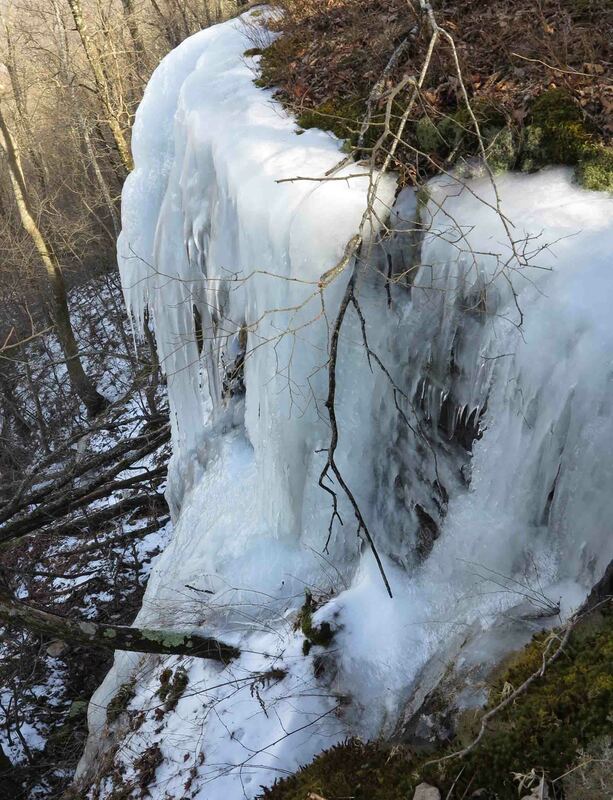 Some massive ice flows covered portions of bluffs, especially those protected from the sun. Some snow remained on the east side of the trail but it was now a slush and safe for walking. It took a while to walk this short loop trail. Found myself gawking at views every step of the way. 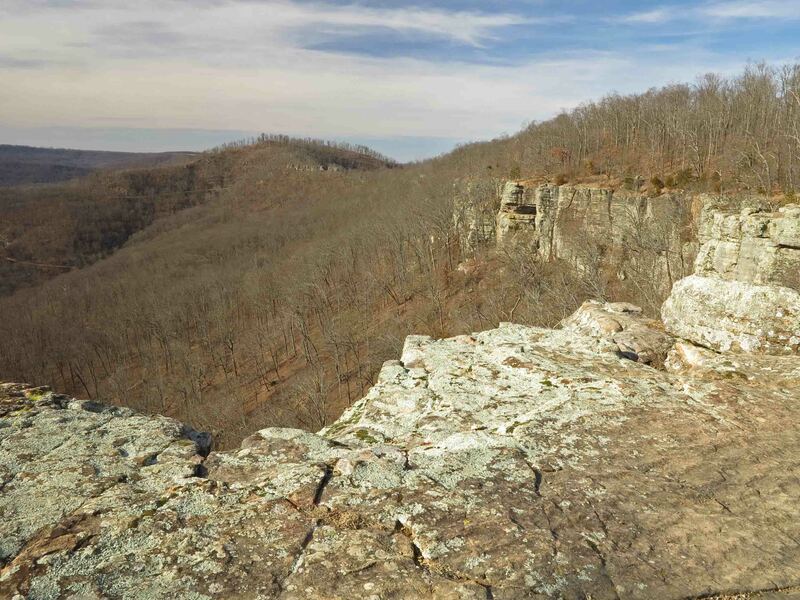 If you do this hike, glance at the trail often to ensure you don’t go over the edge while being entranced by the views. 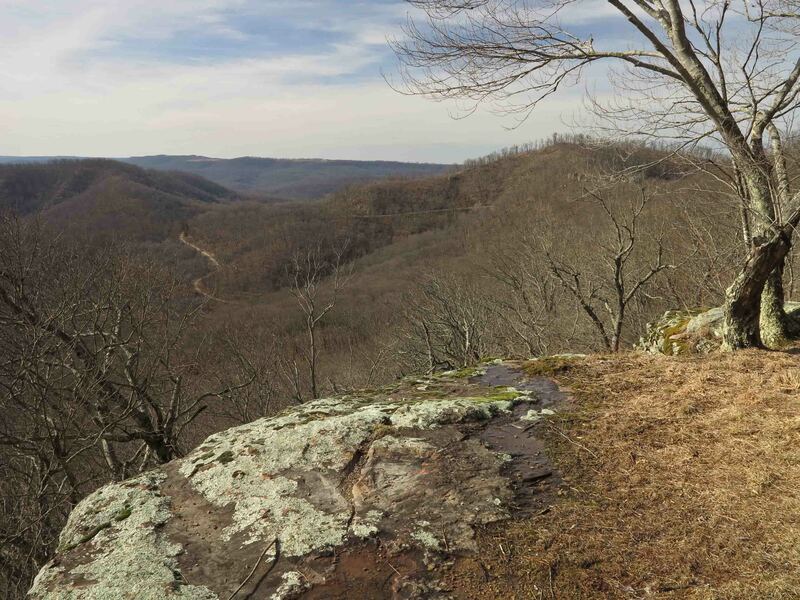 Thank you to the volunteers in the Ozark Highlands Trail Association for trail maintenance! I saw a lot of evidence of work done last fall. Hiker-dog and I would like to spend a few days camping on White Rock Mountain and exploring this loop with my camera in different light and at different times of the day. Rustic cabins close to the trailhead are nice options, too, but Hiker is definitely an outside dog! Shelter on the southwest side of White Rock Mt. 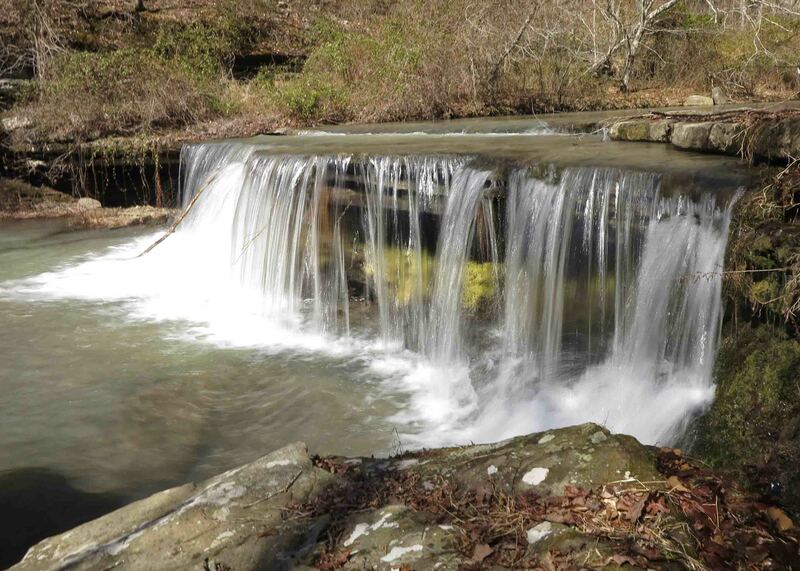 Shores Lake Campground – Take Exit 24 from I-40 and drive north on AR 215 for 9 miles to Fern. Follow AR 215 right at 9.4 miles. At 12.2 miles, drive straight off of AR 215 onto Bliss Ridge Road. Turn right into the Shores Lake Campground at 13.6 miles. The trailhead is at the north side of the campground. 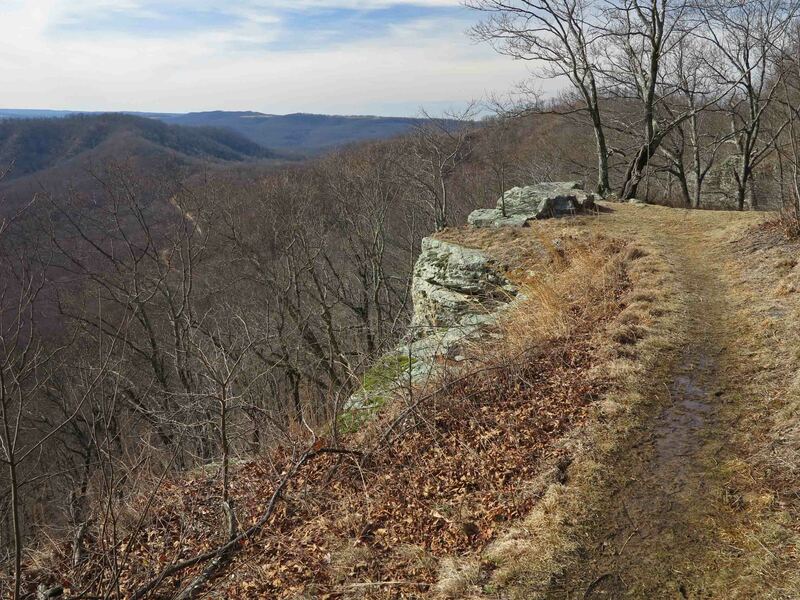 White Rock Mountain Loop – Continue past Shores Lake Campground on Bliss Ridge Road (dirt) for 4 miles then turn left onto White Rock Mountain Road. After 2.2 miles, turn right and drive the final 1 mile up to White Rock Mountain. 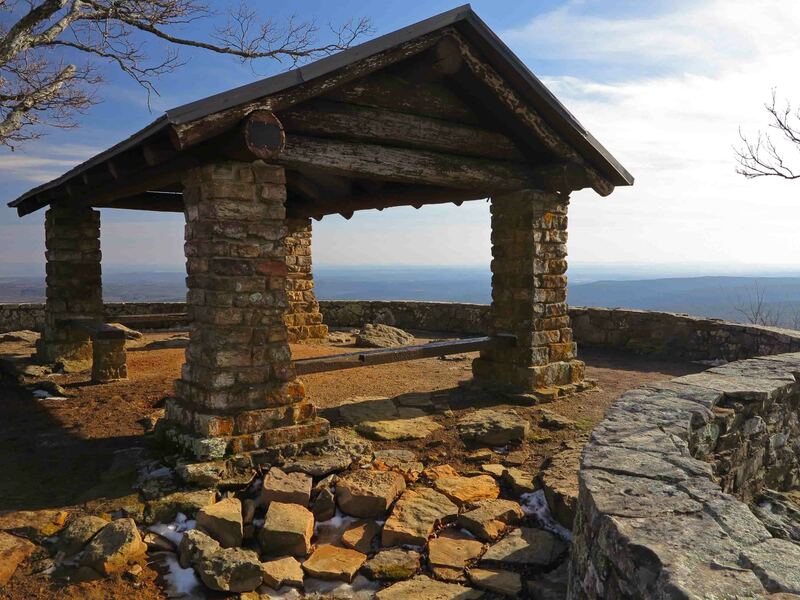 Continue past the White Rock Mountain Campground, caretaker’s residence, and cabins. The White Rock Mountain Loop Trailhead is at the end of the road. Total distance from I-40 is approximately 21 miles. 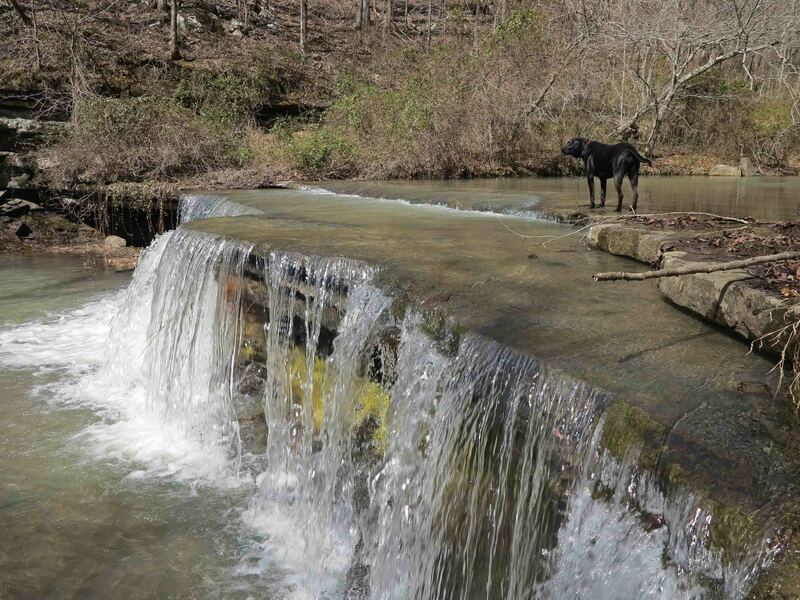 This entry was tagged cabins, Hiker, Hiker-dog, Ozark Highlands Trail, Ozark Mountains, Shores Lake, Tim Ernst, waterfalls, White Rock Creek, White Rock Mountain, White Rock Mountain cabins. Bookmark the permalink. Good to hear from you. Hope to see you on the OHT in the future. I enjoyed the account of your hike and your photos, as always! Thanks for reading and thank you for following Hiker’s progress during the last fifteen months. Just love your hikes and photos. This one gave me an idea for our mini reunion. Thanks so much for sharing this beautiful trail. Thanks for reading, Marlaine. Sounds like you have a good reunion idea. Just watch those steep bluffs if it involves White Rock Mt. This looks like a great hike. Adding to the list. Congrats on the new hiking partner. Brent, Thanks for telling me you’ve added a hike to your list based on my blog. That’s what I like to hear.